This isn’t just a dramatic headline. We wish it was. No, in actual fact it is referring to penalties that citizens could be faced with for nonviolent actions of peaceful protest, under new proposed changes to the Espionage Act which could declare a range of peaceful activities as sabotage. URGENT (update) – TAKE ACTION, these bills were passed in the Lower House Tuesday 26th with bi-partisan support, and are being debated in the Senate Wed-Thurs. For those following this debate at a distance there was a suite of three bills proposed and discussed in the last six months, ostensibly to limit foreign interference in our democratic system. They are: The Electoral Funding and Disclosure Reform Bill (EFDR), The Foreign Influence Transparency Scheme Bill (FITS) and The Espionage and Foreign Interference Bill (EFI). Whilst these bills were pitched to update Australian legislation to manage emerging threats of foreign interference in elections and political decision making, they are instead a trojan horse of civil liberties and human rights breaches, wildly over the top, and sloppily articulated legislation that has had civil society up in arms about the impacts. Did you protest the Iraq war like we did? Well Andrew Wilkie MP reckons those protests could have fallen foul of the espionage act. Friends of the Earth has stated: We are deeply concerned that the proposed amendments fail to remove the threat to charities. For instance, the original bill risked sweeping whistleblowers, aid workers, journalists, and other not-for-profit workers into its net through its broad definitions. While the suggested amendment introduces a public interest defence for publication of secret documents, there is no guarantee it will protect charities from doing their work. And the breadth of the offence of sabotage, and in particular what amounts to “damage” to public infrastructure, has not been meaningfully improved. The potential for criminalising peaceful protest on measures of international importance remains real. Large non-government organisations have focused much of their energy and public critique on the impacts to funding and advocacy work in the first two bills, and its only in the last couple of weeks that the third bill, the Espionate and Foreign Influence legislation has been more profiled in the media. And it is a horror show. You can read the full bipartisan report here. Submissions to the committee over recent months can be viewed here. The issue is that the Labor party are terrified of being seen to be weak on national security – which means they have compromised heavily for bi-partisan agreement on the EFI bill which could see unprecedented penalties for peaceful activists. The devil is in the detail. The re-defining of some terms, and the complete lack of definition for others, has massive ramifications for peaceful protest, particularly in an era of corporate dominance in the political realm. There is no definition for sabotage or espionage or foreign interference. Yet it is unclear that charities, journalists and whistleblowers will be exempted. There is a definition for public infrastructure which is hugely expanded, “damage” is very vague and catch all – and national security now involves corporate interest. or system vulnerable to future misuse or exploitation. The Committee expressed initial concerns regarding the breadth of the definition of ‘public infrastructure’ in the Bill. Rather than being limited to ‘critical’ infrastructure the definition may extend to almost any publicly or privately owned infrastructure, facility, premises, network or electronic system. However, the Committee accepts that infrastructure of importance to Australia’s national security extends to some private infrastructure. So could that mean, if some peaceful religious leaders block a road in protest to stop the Adani coal mine, a foreign owned company – that instead of a simple obstruction of traffic charge – which they would cop on the chin as a reasonable consequence for an act of principle… that they could be charged with sabotage and risk a jail sentence of 15 years? What about the peace activists who swam onto Swan Island naval barracks in an act of nonviolent resistance to Australia’s involvement in the ongoing wars? Or blockaded the gates to the military facility? 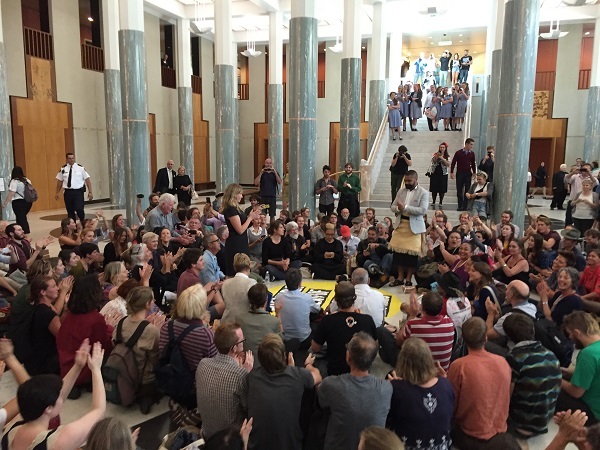 What about peaceful activists who occupied Parliament House and temporarily blocked access, and sought to highlight the Australian governments failure to act on climate change to the United Nations – involving speakers from the Pacific Islands being inundated with rising waters? Get on the phone – tell your local Labor MP or Senator to pull the bill. Politicians are using the by-elections as an excuse to push this legislation through quickly that will do permanent damage to our democracy and ability ato advocate for a safe climate, and for social justice. The proposed changes are so damaging they need to go back to the drawing board, properly this time, and take on the concerns already clearly articulated by members of civil society and charity groups that collectively represent millions of Australians. This is a HUGE issue in and of itself. It is part of a broader trend that we are seeing business and economic interests being placed of higher importance. We have seen this with anti protest legislation in Tasmania and other states that prioritised business over human rights. And of course it is no surprise that whilst charities, journalists and whistleblowers may still be impacted by this legislation – corporations are excluded. Charities falling under this new class of political campaigners will need to register with the government, and ensure that funding received from foreign donors is not used as part of any campaign about an issue that might be deemed political. The best overview on the package of bills is from the Australian Lawyers for Human Rights. The Hands off Charities Alliance has gathered some case studies that paint a picture of some of the broad impacts of the proposed legislation. At the end of last year the government flagged changes to address issues around Foreign Interference into donations, but over stepped to the point that even the Institute of Public Affairs spoke out against the bills. The Institute of Public Affairs (IPA), actually called for the legislation to be withdrawn, “The IPA is inherently concerned about any proposal that seeks to ‘manage’ political debate by limiting freedom of speech,” IPA research fellow Gideon Rozner said in a statement. “At the very least, the Turnbull government must implement the committee’s recommendations in full to spare civil society from this deeply flawed bill. There has been a strong public campaign against many aspects of a couple of the bills, but still significant concerns have not been taken on board. There is absolutely no need to rush through such significant legislation. AG Christian Porter used the furphy of the upcoming bi-elections to justify passing the proposed changes so quickly. We need to call on the ALP to step up, and for once, defend human rights, instead of remaining in lock step with the Liberal Party. 18th June – Oxfam, Communities Council Australia and Pew appeared before the committee to speak to the Foreign Interference and Transparency legislation. Read more from Pro Bono news here. The FITS Bill would require groups – including charities – to register every time they undertake communications or lobbying activities on behalf of, or with the knowledge of, a “foreign principal”. Attorney-General Christian Porter told Fairfax Media the tougher measures were needed before voters go to five byelections in four states on July 28, given the rise in foreign interference. Greens and ALP have signed onto some basic principles that should guide any new legislation to protect charities. Article here. “The alliance also insists charities should be “free to cooperate on issues-based advocacy to advance issues of public interest, including by working with non-Australian citizens and non-permanent Australian residents”. IF YOU FOUND THIS USEFUL – please consider a tax deductible donation so we can keep informing grassroots activists of their rights.